On Tuesday, when I was fasting and girding my loins for the prep mix I needed to drink, his nibs was at work. He stopped at Trader Joe’s and Costco on the way home for milk, eggs, gas, things we’d run low on before we left town. At Costco, he bought a rotisserie chicken — $4.99 — something we’d never bought before. He needed something for dinner because he knew I was fasting and wouldn’t feel like cooking, and he didn’t want anything complicated. Roast chicken sounded good to him (and smelled sinfully delicious to my poor fasting self when he arrived home with it). He said the rotisserie chicken shelves, usually filled with packaged roasted chicken, were bare and a line of people (young, old, moms with kids in tow, more) waited for the butchers to take the roasted chickens off their spits and packaged them up. Tuesday night he had roast chicken for dinner. Wednesday night we both had roast chicken for dinner. Friday night I stripped meat off the chicken carcass and legs and made chicken pot pie for dinner, setting aside enough white breast meat for two sandwiches or another meal. Friday, while the pot pie was baking, I broke the chicken carcass into pieces and put it and the wings and the leg bones whose meat I’d used in the pot pie into a pot. Added chopped fresh garlic, ground pepper, chopped carrots and chopped onions. Covered just barely with water and let it simmer. After dinner, I fetched out some of the bones and picked the meat off, then threw the bones back in and set the pot to simmer some more. Let the pot cool overnight on the stove. Yesterday afternoon I picked the bones out of the cooled broth. All the meat had fallen off the bones and the broth had thickened due to the collagen in the bone-ish bits. I took the hand blender and swirled the broth and chicken and carrots and onions and garlic into a thick soup and put the soup back on the stove to heat up. Meanwhile, I minced up a few cloves of garlic and browned some button mushrooms in butter and half the garlic. Tossed them into the soup. I snapped some green beans and cooked them in butter and garlic for a bit and tossed them (still crisp) into the soup. Added some hot curry powder and some fresh tarragon I fetched from the deck while we were giving the architects the grand tour. Slice four pieces of sourdough bread. Lightly butter one side of bread. Finely mince two garlic cloves. Sprinkle minced garlic on bread slices. Broil until cheese melts and turns golden brown. What’s left to eat from our $4.99 roasted chicken after one dinner (Tues), two dinners (Wedn), two potpie dinners (Fri), two soup dinners (Sat)? What’s left is enough breast meat for two sandwiches or two dinners and enough leftover chicken pot pie for three-four dinners. Maybe those $4.99 roasted chickens from Costco are a better deal than I realized. Item listed in an upcoming Sotheby’s auction. You’ve been saving your pennies, being frugal as can be, waiting for a buying opportunity in this depressed economy. Cassius Marcellus Coolidge was well-known in the Rochester area of New York for his paintings of anthropomorphised canines surrounded by the trappings of successful middle-class life. Typical subjects included the all-night card game, a trip to the ball park, commuting to work and even arguing a case in court. A great deal of attention is paid to the dogs’ clothing, details of their surroundings and to a humorous variety of facial expressions. 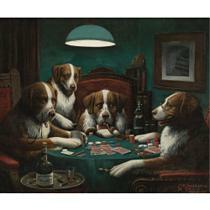 Cigar companies, the artist’s first customers, printed copies of his paintings for promotional give-aways, but the printers Brown & Bigelow made Coolidge’s dog-genre familiar to the general public as advertising posters, calendars and prints. I’m a huge fan of Paul Madonna and his ALL OVER COFFEE work in the Sunday Chronicle. I’ve had an overwhelming response to this week’s “Obama:Progress” All Over Coffee piece. Since the original sold within the first few hours it was published, (including a backup waitlist) I decided to make a fine art limited edition print of this particular strip to honor this momentous time in history. The full-color print is 16×22 inches, signed and numbered in a limited edition of 100, at $195 each. Produced by the fabulous printer SF Electric Works, these prints are of the highest quality. If you missed Sunday’s Madonna, check it out. If you don’t know ALL OVER COFFEE or Paul Madonna, check him out.